My name is Bob Mills. I was born January 1940 and have been spending summers at Halls Lake every year. These recollections and stories are just a small part of our family history. It all began when my grandparents David and Alma Hyslop bought 1500 feet of waterfront on the south side of Buttermilk Falls and along the east side of Halls Lake. They had six children (four girls and two boys), with my mother Marjorie the second oldest. Family documents show my grandfather purchased this land for $.50 / ft. in 1931 just at the beginning of the Depression years. He also had the opportunity to purchase the entire 1000 foot strip of land on the north side of Buttermilk Falls on what later became the Cherokee Lodge property for $.25 / ft., but turned it down as it did not fit with his plans. While the purchased property was for a summer home, grandfather also had lumber interests in the area with one of his sawmills on the west side of Halls Lake near what is today the entrance to the Stouffer Mill B & B.
Jack McCallum was the local builder of their large five bedroom two-story log cottage they named ‘Wagon Wheel’. Most interesting, the structure was built as a closed box with the doors and windows cut out after construction. This was (and still is) a beautiful example of hand craftmanship. The stairways and railings to the second floor were all hand-carved from logs and tree limbs. A suspended wagon wheel from the ceiling held a dozen candles and numerous oil lanterns which provided the necessary light in the evenings. A hand cut stone fireplace and very large wood stove in the kitchen provided for both heat and cooking. The stove even had a section for baking and another to hold heated water. Grandfather was also in the food processing industry with his company called Tip Top Canners Ltd. They had three processing plants in the Burlington Ontario area and it was on that basis that much of the basic canned food was brought from their home town. 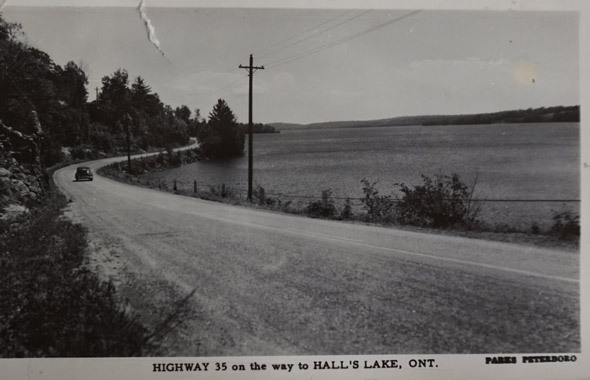 During the 1930’s and war years a delivery van toured Halls Lake on a weekly basis. That is where my grandmother bought milk, bread, flour, butter and eggs. Fresh-caught trout and bass from Halls Lake were also a regular staple and seemingly an endless supply. Tip Top Canners was also a major supplier to the military during World War II, with many of their products being shipped overseas to the Canadian troops. There were three separate and important ‘out’ building a boat house, an ice house and the traditional two-seater outhouse, jokingly named ‘The Stork Club’. The latter always had a great collection of Sears Catalogues that could be read while seated or used otherwise!!!!! The ice house (still standing ) was extremely functional as electricity did not come along until the 1940’s. 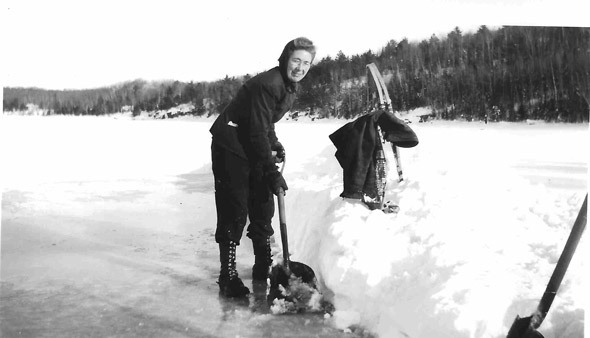 My grandfather told me how each winter he contracted with local men and special saws to hand cut some 100 + large blocks of ice from Halls Lake. They were then stacked in layers between sawdust from one of his mills. Each summer day the kitchen’s ice box refrigerator would need at least one large block of ice and sometimes two. Splitting short logs for the cook stove was another chore as this was the only way of preparing food and there wasn’t a day when it wasn’t operational for the family of eight. A special-designed wheel barrow was used to haul both kitchen and fireplace sized logs from the wood shed every day. Water to the kitchen sink came from the lake via a hand pump and then was heated on the cook stove for washing. Even in the 1930’s there was an artesian well on the west side of Halls Lake and this is where drinking water was collected in pails and brought back to Wagon Wheel. The entrance to the property from Hwy. 35 was quite distinctive, as there were two five foot high ‘Red River’ wagon wheels mounted in concrete. I should also mention that grandfather had numerous stories about their motor trips from Burlington. Gravel roads all the way and it took all day. Two flat tires per trip would not be unusual and at Miners Bay there was always a delay on the half-mile-long hill heading north. In the 1930’s many cars still had gravity feed carburetors so it was necessary to turn the vehicle around and back up the hill or otherwise the car would stall before reaching the crest. Once you reached Minden, the north bound road at that time, followed along the shores of most of the lakes so that in itself made it a slow and winding but a picturesque trip. Highway 35 leading up the hill towards Highland (now Braeloch) Road and Buttermilk Falls. The surfaces were all gravel back then. As for entertainment, it’s surprising now to realize there was a dance hall at Halls Lake directly opposite to what is today the bakery named Sage. Every Friday and Saturday night from the late 30’s through the war years my mother met with friends and danced the night away to 78 RPM records and on occasion, a live band. Much later in the 1950’s came other dance hall venues in Carnarvon. These were Medley’s and Maebar. One day my grandfather decided it was time for the next generation to put down more permanent roots at Halls Lake so he divided up the property for any of the family who were interested. My mother and two of her sisters jumped at the opportunity and each selected a treed lot. 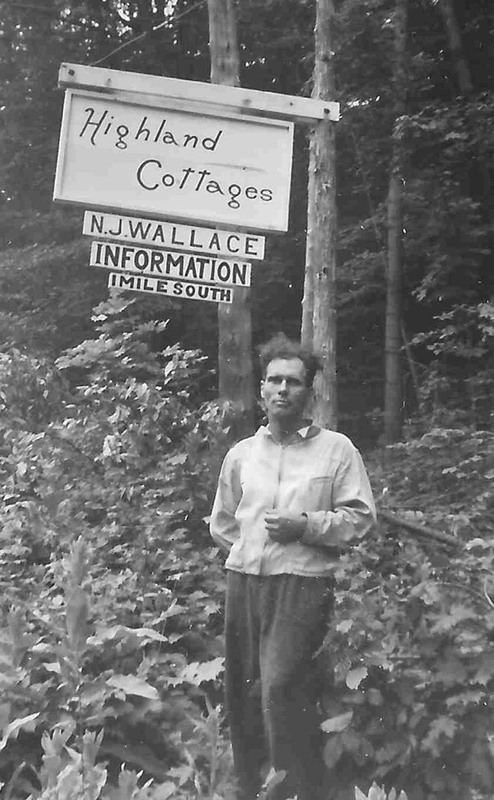 Our family contracted with Norm Wallace for a small three bedroom cottage made with 2×4’s. Ray Packard built the stone fireplace using local granite. By 1951 the Mills family had a small, very basic uninsulated cottage on the lake with cold running water. Hot water came many years later. My early life at Halls was full of fun and adventure. Collecting worms and crawfish from below Buttermilk Falls and then fishing for small mouth bass in our ‘secret’ spots around the lake, hiking into the woods for picnics, picking raspberries along the Highland Road (now Braeloch) and learning how to operate the outboard motor. My grandfather had a large ‘Peterborough’ type boat at the cottage with a rope start 1940’s 25 horse power outboard. This was a very powerful motor for its day with many levers and knobs to turn in adjusting the timing, spark, choke, fuel and throttle. There was no neutral position so most important you were pointing out into the lake when the starting rope was pulled. Coming into the boathouse was a big learning experience on any windy day. Knowing exactly when to shut off the spark and stall out the motor was critical. Too short and you were forced to paddle in and too late meant crashing into the boathouse wall. Throughout the 1950’s a large sawmill operated on the shoreline behind what was then ‘the island’. Timber logs for the mill were dragged from the forest in the Hawk Lakes area, tossed into the water which eventually saw them dropping into the log chute and floating down river to Halls Lake. Once through the narrow opening behind the island the logs were then collected into large chained booms until ready for the saw. The mill was a potentially very dangerous place with endless belts, chains and other moving parts that could cause serious harm. My mother drilled into us that this place was totally off limits but the sounds and smells were a magnet for a number of us as young teenagers. Sneaking in by boat to watch all the action was great sport as long as mom and dad did not learn what we were up to. Doug Adamson owned Cherokee Lodge just across the small bay from our cottage and as a youngster I was fascinated by his almost daily flights in the yellow canvas covered Aeronca Super Cub. Many early mornings he would head off with a canoe strapped to one of the floats. In my mind this was exciting beyond belief and probably what eventually sparked my initiative many years later to earn my pilots license. Doug would often bring back a stringer of small mouth bass from some ‘secret’ location and his guests would then enjoy some fresh fish for breakfast. During the 1950’s and 60’s there were a number of summer camps with two of them (Calumet and Sherwood Forest) close by on Boshkung Lake. I’m not exactly sure why, but my parents thought my brother David and I would benefit from the experience so off we went to Camp Calumet for 3 weeks in 1952. An overnight canoe trip, songs around a camp fire, making a bow and learning to water ski come to mind…..but so does the thoughts of mosquitoes in our tent, cold showers, smelly damp clothing and bland repetitive camp food!!!! Fast forward to 1963, and our cottage has been insulated, hot water installed, and larger boat docks. In August that year I proposed marriage to my longtime girlfriend, Lynn at Aunt Sara’s Lookout. 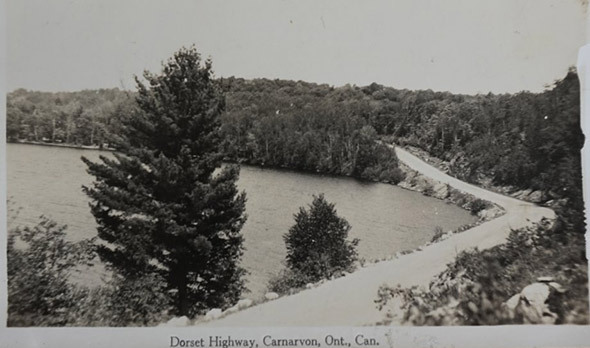 This was an established roadside park right near what is now the turnoff from Highway 35 onto Little Hawk Lake Road A few years later we were blessed with a son and then a daughter and they in turn have been spending their summers at Halls Lake ever since. As a result of their marriages we now have four grown grandsons and it won’t be that far into the future when another generation (our 6th) will be starting their summer adventures at Halls Lake.